Grab How to NOT Gain 10 lbs This Holiday Season TODAY! Don’t wait until after the holidays when you feel sluggish, tired and unmotivated. PLUS GET- 20 REAL Recipes! This is an AMAZING special price of only $9 for tips, strategies and recipes you can use the whole year long – NOT just at the holiday season! The holidays can be such a special time to enjoy with friends and family, and they can be a wonderful break from the ordinary ways and routines. But the reality is that the holiday season can also be a stress-filled emotional rollercoaster. Between having to make it through that long holiday party with crabby Aunt Edith and your overly critical brother, choosing the just-right Secret Santa gift for the co-worker you don’t really like all that much, making those holiday cookies your 7-year-old told you he needed at the last minute, finding the perfect holiday dress that your 13-year-old likes and then showing up at your spouse’s work party with a smile, you might want to skip right over the holidays. As the holiday season approaches, you may feel sad about a lost loved one, angry that your sister isn’t much help with the big dinner and worried about how you’re going to get everything done that you need to do. All of this can lead to you convincing yourself that you don’t have enough willpower to eat well, exercise or get enough rest. Why even try? You end up giving up and telling yourself you’ll regroup in the New Year. But then what happens? The New Year comes and you’re discouraged with the number on the scale, how your clothes aren’t fitting and your total lack of energy. Not to mention your skin looks dull and your eyes are less than luminous. You feel you’ve dug yourself into a hole that‘s going to require desperate measures to get out of! We want you to know that while you don’t have control over every situation or the people around you, there are lots of easy things you can do NOW and throughout the holiday season to help you not just survive but THRIVE during this busy time. And none of these things involve counting calories or depriving yourself! Sure, the holiday season is a time when we all feel a little justified about indulging in overabundance. Especially when it comes to food—food is a central part of social get-togethers and parties around the holidays. But we’re going to show you HOW to make smart food choices even when you are surrounded by mountains of food every day. First, let’s start by debunking 5 myths that will keep you overweight, sluggish and craving unhealthy foods and habits. Once we dispel these myths, you’ll be ready for 10 REAL tips that will help you burn fat, boost your energy and kick your cravings! We just ask you to read through the whole guide actively. That means don’t read and say, “Yeah, that’s a good idea, but…” or “That would never work for me!” or “I’ve tried that before and it didn’t work.” We’re asking you to read, think and make a plan that you can commit to because—as you’ve no doubt heard before—when you fail to plan, you plan to fail! 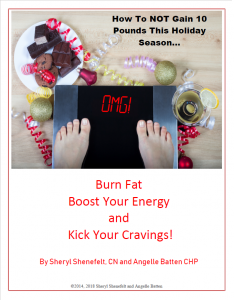 DON’T WAIT – Get How to NOT Gain 10 lbs This Holiday Season TODAY!